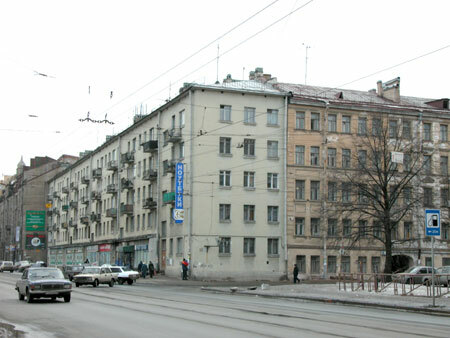 Many Russians complain on the state of their lobbies in multi-apartment houses. 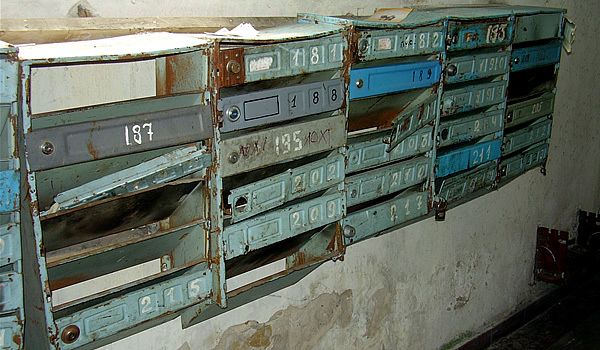 For example this how do often look like the mailboxes in the lobby of a regular house like above in the picture. It’s not abandoned, it’s not populated with low level alcohol abusing people, just a regular lobby, and many Russian people would agree that this can be met way to often across all the Russia. its true…..I’ve never seen a house in Ukraine with good looking mailboxes…. That’s true, I miss so much when Hitler taked care of us, he was so friendly, like a father for whole europe. Nu vot my kulturnyi narod, tol’ko z etim Larussom khuyinia! I see these mailboxes in apartment buildings no more than 3 years old. People paid lots of money to live there. I just don’t get it. I have a friend who takes takes pictures of these russian mailboxes. She has a huge collection of really cool pics like these. Come to think about it I have never seen a russian apartment door with letter slit, only these strange boxes on the first floors. I sincerely hope that missile shield will be installed on russia’s borders. If all russians are like the prick above, Europe must be protected. And Boris, you call yourself a Jew, yet you exchange conversation with this racist and encourage him to make further statements like the one abouve. If you are Jewish, you need to grow up and figure out where your true priorities lay. I totally disagree. Violence is the only way to pacify certain ethnic groups whose culture is based on violence. They just dont know anything else and immediately consider merciful victor as weak and therefore deserving to be immediately killed. So vilonce is the only way forward? What, like it was in the War on Teror, Afganistan, Palestine, Chechnia and now Iraq? Let’s take another more effective example of peaceful strategy. Inmplemented by surprise suprice, Russia. After years of war Russian has made one right desition of declaring an Amnasty. And what was the result of this peacefull gesture? – End of war in Chechnia and virtural disolvmant of all chenchen extremist groups. I aint touching this convo either. You are forgetting that violence was not properly done in those examples. Its a one-legged violence that keeps going on and on and on… in the end contributing to more deaths in total rather then a swift but deadly “clensing” approach. In the end you save more lifes in the long run. For examples look at wars done in pre-20th century. Ultimate example would be Chingiz-Khan. “swift but deadly “clensing” approach” – no offence, but that sounds like an approach used in Nazi Germay. Well hey, it worked for Germany, it can work anywhere. Then again the middle east (namely northern Iraq) has been trying this for centuries and just can’t get it right. The problem isn’t with killing the people, it’s with killing an idea. The idea is religion, and religion is a virus. In the case of the middle east the virus spreads with no antibiotic. Just remember what the inoculator’s loop says, fire cleanses all. Well, this approach has been used by humans until western civilization took place. So nazzies just blended early human viciousness with western culture – thats why it looks so horrible to us, because we relate to the western culture and its people of our own ethnic background who did this. It still looks awful to read about what Chingiz-Khan did, but at least we realize that this was a totally different culture and mentally take a by-stander approach. And btw, western civilization is not the only one is the world, with its values meaning nothing to others – especially mercifulness part of it. Thats what i’m saying: acts of mercy will be honored by ones, and considered as weakness by others. Like or dislike it, its a fact we have to deal with. Even so, it’s better then “swift but deadly “clensing” approach” as Mrcann Hitler has mentioned abouve. In the past wars aggressors dint have to kill everyone of population to achieve order. The aggressor had simply to *officially* state that punishment will be quick and extremely severe without “if”s and “but”s. Punishment was dispensed not only to the one who acted against aggressor but also to his neighbours and family. In the end result was achieved and the only thing i speculate about is how many lifes it cost. My speculation is not many, definitely less then if aggressor rather resorted to half-measures only. Also, another thing that i’m saying that these “half-measures” would work very well against people of western culture, so amnesty, etc will be good. While resulting in a reverse effect if applied to people of some other cultures. Sarah, wake up! Nebu99 is using your screen mame!! Did you really expect me to believe that Sarah could make such a disgusting statement? She/he might be an annoying troll but onlly someone as full of hate as you, could make such a comment! Brothas railn all types of white meat. Yall know dat. Balls? Balls are not required to make a simple observation. This reminds me of a trip I had to Russia to a large city where I had to stay in a building like this. Not only were the mailboxes like this, but people burned doorbell switches and stole parts from the bell above. The room identification numbers were scribbled on, and taking the elevator was just scary. Funny thing, some plumbers were changing the 30+ yrs. old rusted pipes near the entrance, and put them beside the dumpster with water still coming out of them. Within 30 min., some people took them. Also there was junk lying around everywhere on the ground near the building (thrown out the window), and even construction waste such as a door. picts or it didnt happen. We have run-down buildings like those in the USA, because they are owned by what we here call “Slum Lords”. All they want is the rent money, and a lot of the renters are on Section 8 (government assistance). The Owner of the property is responsible for the landscaping and maintenance. The nicer apartment buildings are Condominiums. that is where the occupant actually own their Flat, and the gardeners and maintenance crews are payed with a monthly fee to the local home-owners association. Pride of Ownership makes for nicer neighborhoods. 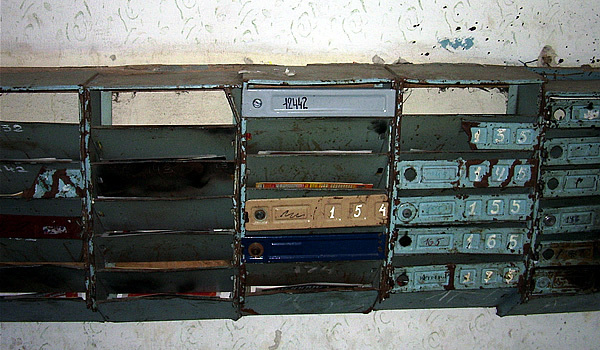 In Russia about the only type of mail that people receive on a regular basis is the monthly ‘kommunakala shchot’. It’s basically a monthly bill for water, gas, building maintenence, trash pickup and heating all in one. They are delivered without envelopes. People don’t steal them because they are worthless. The other type of bill would be a phone bill and they are delivered in a similar manner. If perchance and REAL mail needs to be delivered the postal worker leaves a claim form to the addressee who can then pick up the letter at the post office after presenting proper identification. Section 8 is a term used to describe slums. It must have been a long time since you checked the subways! Who has a cleaner one? Berlin, Vienna and Amsterdam come to mind immediately. More graffito in Europe, but without the horrible stuck on paper ads like Moscow. The wagons are clean enough, the main point is outside the stations. Away from center of city, where marshrytkas run, stations are disgusting by evening every day. Looking like aftermath of some rock concert. If dvorniki went on strike for one day it would be big problem. It leaves a bad impression even if wagons and platforms are kept clean. I’m guessing you never rode a New York subway. Never did, I’m sure it isn’t pleasant. That modern day bloody Babylon. Even before UN it was like Sargasso Sea of humanity. Africans, Arabs, Slavs, etc., all the putrid filth of mankind gathering in one location. Still, I’m sure the metro stations aren’t as bad as in Moscow. I’m convinced that Moskvichi are the nastiest white people on the planet. what had they done to you? Whre does all the money go? $24.83 for a CD? No wonder they pirate. International daily newspaper – $6.30 no wonder everyone just sticks to local news. If anyone can provide prices of other items in Moscow, I’d like to know please. large excellent laundry room very clean, state of art mailboxes too. quite worse in some regards – they can ask $1000 for a filthy soviet-style 1 bedroom unit. up to $900 for a filthy studio. bence çok saçma bazıları bilmem evler yamuk filan milan ben onları hiç beğenmedim daha güzel adamca bişey yapabilirlerdi. Hah I am honestly the first reply to this awesome article? !